Its 2:24 A.M., A New Moon. 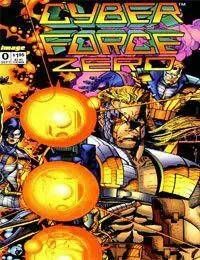 Cyberforce (Ripclaw, Cyblade, Impact, Heatwave and Stryker) battles a group of S.H.O.C. (Special Hazardous Operation Cyborgs) troops (Buzzcut, Psychotron, Killjoy, Megawatt and Ace of Blades) from Cyberdata at the Advanced Tactical Weapons Research and Development Facility of the American International Dynamic Corporation. When the SHOC troops flee, they leave behind one of their members, Ace of Blades which got knocked out by Impact. Stryker retrieves Ace of Blades and Doctor Corben extracts the implant in his brain that Cyberdata uses to control their agents. Stryker then recounts his history with Cyberdata and how is it he was able to leave their possession with the help of Stormwatch. After he leaves, thinking that Ace of Blades has the right idea of getting out of this profession, Ace of Blades loses his life in an explosion.